A premium fully synthetic automatic transmission and power steering fluid, specifically designed for use in Japanese, European and North American vehicles. It meets the requirements of Nissan and Subaru in all of their vehicles with automatic transmissions, and especially those with slip lock up torque converters*. Now suitable for use in Ford ZF 6 speed transmissions, plus many other new applications. 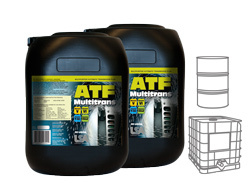 An Automatic Transmission fluid which is suitable for use in most Transmission and Power Steering applications, permitting rationalization of grades. * Note: is not recommended for use with CVT, DCT or Ford type F transmissions. Not recommended for Allison C4 off highway transmissions.